Day 2 in Central Otago. It has certainly been more than a 100 a day photograph experience. The autumn colours are tremendous and being with Gary and Rose we have gone to places we didn't know existed as well as ones we did. Today we drove through to Queenstown to collect rental car stopping at an amazing place called Tuckett's Beach en route. 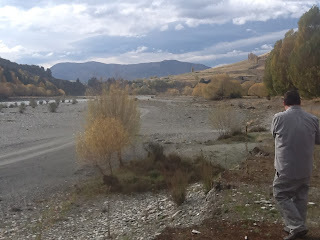 Tuckett's Beach is actually not a beach - which won't surprise you as Queenstown is the most inland spot in NZ but actually is a large sandy area on the Shotover river with views to die for. So I have determined that the Kirbys are Family of the Year 2013. And let those who dare challenge us!! As Aunt of the Decade for 2010 (another self appointed title) we are expecting Mike and Bex any moment. They went through to Dunedin today to collect their new van (we guess Micaela's old Corolla has finally died). They are having dinner with us on way back to Wanaka. Gary and Rose gone home but we are having tonight at their Cromwell house and heading to Chch tomorrow from here. As Friends of the Year 2013 they have offered use of this place to you Mark and Stacey if you do a pre Christmas trip to Central.